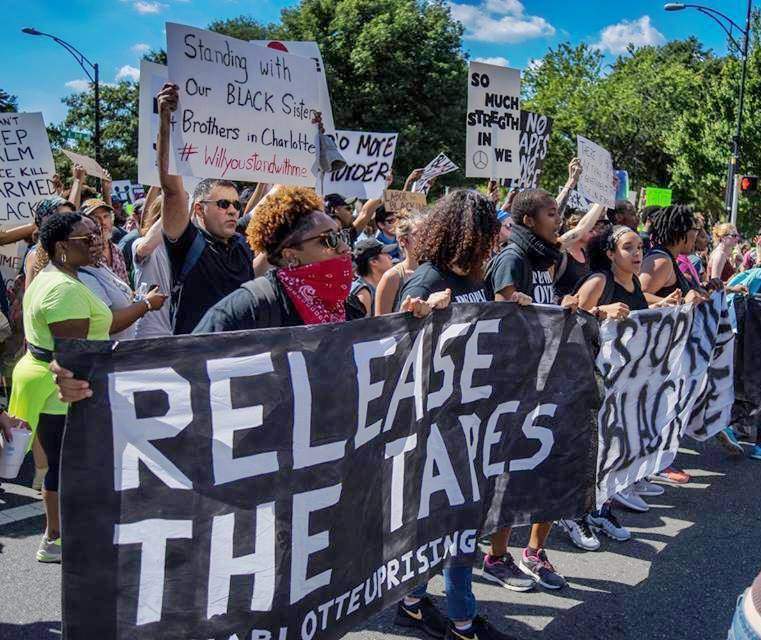 The truly heroic forces of the Charlotte Uprising have carried out a great struggle to get justice for Keith Lamont Scott, who was murdered in cold blood by the cops on Sept. 20 while waiting in his car for his son to come home from school. Now they are also fighting for freedom for Rayquan Borum, who has been framed up for the police killing of Justin Carr during the rebellion. Eyewitnesses say that the rubber bullet that killed Carr was fired by the police. Only the police have rubber bullets. In the course of the righteous rebellion, the Uprising has pushed back the cops and established an important precedent that the movement should study and try to follow. They have carried their rebellion to the commercial and financial centers of Charlotte, the Wall Street of the South. For example, Bank of America, Wells Fargo and Duke Energy, the real ruling class of North Carolina, were forced to tell their workers to stay home for several days. The commercial EpiCenter, which houses businesses, a major hotel, restaurants and bars, was invaded and business has fallen way off. There were major cancellations at large hotels. The Westin Hotel had three large groups cancel, losing several 4,000-room nights of business. The Aria Tuscan Grill restaurant had 300 reservations on a Friday night and none of them showed up. According to the owner of the Aria Tuscan Grill and City Smoke, “I remember 9/11 vividly, and remember thinking that was the worst. This event is even bigger.” (Charlotte Observer, “Unrest ‘huge blow’ to uptown hospitality industry,” Sept. 28) There was also damage to Walmart, the Omni Hotel, the Hyatt, the Charlotte Convention Center and an office tower near the NASCAR Hall of Fame. There were boarded-up stores in both downtown and uptown. Demonstrators blocked interstate highways I-77, I-85 and I-277, all of which are important access routes to the commercial districts. The police had to shut down I-277 for several hours. The Carolina Panthers game on Sept. 25 was the most undersold game in two years. With tickets costing $120 each, much revenue was undoubtedly lost. The protesters’ victory so far has been to force an adamant police chief and the mayor to release police videos of the shooting. The police initially refused to release them. Police Chief Kerr Putney spoke the day after the killing. With Mayor Jennifer Roberts by his side, he firmly refused to release any videos on the grounds that they were part of an ongoing investigation. Putney started litigating the case in public right away, declaring that Scott got out of his car with a gun and pointed it at the police. The next day, as the rebellion grew, Putney said that even if the videos didn’t show Scott with a gun, the cops found a gun. Later they said they found an ankle holster. Of course “dropping a gun” is standard police operation when they want to cover up a killing or frame up someone. One video also shows the cops yelling at Scott, “Drop the gun.” But the police knew full well that the dash cam was on them and they acted out their lines accordingly. A day later Putney said the cops would release the videos when there was a good reason to. And finally, in the wake of the movement’s calls for his resignation, Putney totally reversed course on Sept. 24 and said he would release the videos. So far the police have released partial videos; they are due to release much more video. This victory is going to put pressure on police departments across the country to release videos of police shootings. And it was done in a matter of days. This is no small accomplishment. In Chicago the movement could not get the release of the video of Laquan McDonald’s murder for 14 months, and it was only released after a court order based on a lawsuit by a reporter. At the present time, the movement against racist police killings and brutality does not have the force to take on the state directly. The local police are militarized, as are the state police and the National Guard. The state can only be pushed back indirectly, by interfering with the sales and profits of the banks, big business, and medium and small businesses. Because the cops are, in the end, only the servants of business, it is the capitalist ruling class that can be forced to tell their servants to pull back. Of course, the ruling class is secretly behind the new wave of repression being brought against the Uprising — including hundreds arrested, new warrants for organizers and the frame-ups of key people. It is quite expected that the ruling class will strike back with repression. But no matter what, the victory has already been accomplished and cannot be erased. And the repression must be fought, not just by the Charlotte movement, but also by people from the entire country in the struggle for Black lives. Displaying extraordinary heroism and determination, the Uprising refused to be intimidated by a massive show of force. Hundreds of cops in riot gear, showering rubber bullets and tear gas, and wielding clubs, could not drive the demonstrators off the streets. The Uprising defied a state of emergency declared by the governor and curfews by the local government. The activists came back, day after day, night after night. While they could not defeat the state outright, they also refused to be intimidated. They pushed up against the cops, the Guard and the state police. And they stayed in the streets. This struggle has illuminated the relationship between the bosses and the cops. That alone is an accomplishment. Of course, there still has to be the indictment, the trial and the conviction of the cops involved. That is a much larger struggle. But the Uprising has shown the great potential of a truly grassroots rebellion.